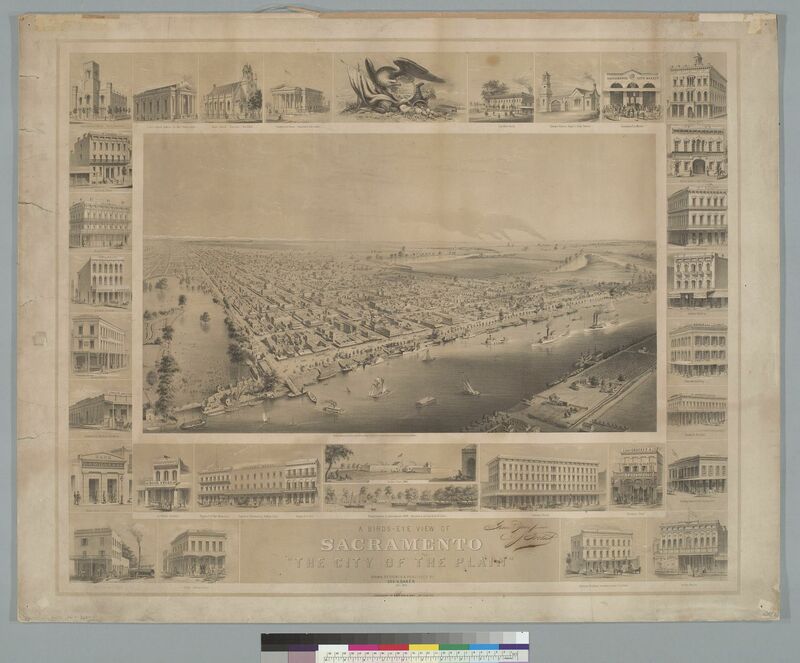 Evidence has emerged that Sacramento City’s lost twin, Boston, was more than a paper town! Thanks to the sharp eye of librarian James Scott, we know that an 1880s newspaper article revealed apparent eyewitness accounts of significant development north of the American River during the Gold Rush. This appears to confirm elements of a Confluence report published in June, most notably that the site of Boston was an important crossroads if not a suitable townsite. On June 18, 1886 the Sacramento Record-Union published a story called “The City of Boston: A Pioneer Rival to Sacramento.” Most of the column was dedicated to reprinting Edward Gould Buffum’s 1850 description. I previously considered Buffum’s account too far-fetched to be more than exaggeration – perhaps made by someone with some sort of financial stake in a potentially lucrative real estate scheme. The above reads almost like a fiction to many, but its truthfulness is vouched for by pioneers, who remember the long rows of white tents in the “Western Hub” in 1849-50. The site is now owned by Cox & Clark; is uninhabitable for several months in the year; is what is commonly called the overflow; is where two young men were drowned while out boating some months ago. What has become of the twelve-foot banks, above high water, the magnificent groves, the fertile lands free from overflow? Go ask the hydraulic miner. This is not conclusive, of course. An unnamed journalist speaking to unnamed “pioneers” leaves much room for exaggeration or falsehood regarding the “long rows of white tents.” Keep in mind that this writing comes from an era of great historic creativity, in which an alcoholic Swiss immigrant named Johann Augustus was transformed into the dashing “Captain John” Sutter, and Sacramento’s Settlers’ uprising was scrambled into a mere riot launched by confused rogues. A single report that old-timers recall Boston’s existence is not by itself proof of Boston’s existence. Nonetheless, another breadcrumb has appeared in the dust. Now, let’s consider the moniker “Western Hub.” Calling this location a “hub” casts the entire Sacramento area into a new perspective: That is, this peninsula at the confluence was of central importance. For more detail on the geographic reasons why Boston made more sense as a point of arrival to the goldfields, please refer to the previous report. In brief, the western side of the Sacramento River (now Yolo County) was attractive high ground, but was surrounded by nothing but tules – it led nowhere. The south bank of the American Fork was an embarcadero for Sutter’s Fort, deeply entangled with his numerous land claim issues – useful but complicated. And the actual grid of Sacramento City, at least initially, was a sort of a swampy suburb in which hapless newcomers found themselves bogged down in an escalating conflict around Sutter’s false title. If “Western Hub” was indeed a common term for the lost city, it was Boston that seems to have been at the crossroads long claimed by Sacramento. In any case, it seems that Boston’s once-contested land had by 1886 settled into a role as a private route connecting the vast rangelands of the Cox & Clark company, which stretched many miles north on the 1885 county map. The lower portion of the Boston site was under different ownership at this time, but it seems that whatever turmoil rocked Boston in the early days had subsided as Sacramento City consolidated its hold on the confluence. Little remains today, except for an assortment of property lines that follow Boston’s old grid. How Long Did Boston Last? As for the Union-Record’s closing comment on hydraulic mining, it may not be fair to blame that industry – even though it did tremendous and well-documented damage to communities with flood-prone sites like Boston’s, by filling river channels with debris washed down from the mines that washed away mountainsides. Even if we accept that a substantial settlement existed during the Gold Rush, there is still little to indicate that it lasted for long enough for hydraulic mining to worsen its lot. If accurate, this brief apparently indicates that “the city of Boston” was no longer a going concern; its site was apparently at an even lower location than its surviving rival, and therefore Boston faced a greater flood threat. Yet this brief mention is written in a way that suggests reference to someplace familiar to readers. At one point, presumably, that lone building had company. And even after the flood of 1850, someone was still holding on in Boston. The nature of the last building in Boston is somewhat confusing here: The writer seems to have indicated stakes and canvas, but it makes little sense to claim that the house would already have washed away if it were made of bricks and mortar. Obviously, the opposite is true, as a tent would fail before a more permanent structure. It also seems likely that someone who built a brick and mortar structure would have sufficient sunk costs to hold out after the tent-dwelling townsfolk had departed for higher ground. This apparent error all suggests at least one permanent structure was built in Sacramento’s pioneer rival. This still begs the question of why the Sacramento City newspapers were silent on the struggling neighbors, until what seems to be Boston’s last gasp. The trail to Boston remains maddeningly faint, but now we have two data points indicating that it was a significant settlement in 1849-50, and that someone called it home until at least the following spring. And even more striking, it seems that decades later people still remembered the place. Considering the extent to which early Sacramento history has been doctored to support the narrative of the early land speculators, the disappearance of Boston must be taken seriously as another case of revision that obscures the truth of Sacramento’s origins. One of Sacramento history’s best-hidden stories is the tale of our city’s missing sibling: During the Gold Rush, a site called Boston lay just north of the American River’s confluence with the Sacramento River – then located roughly at the new Railyards Boulevard. Boston appears to have been founded around the same time as Sacramento City, and at least two surviving maps show the two urban grids as being comparable in size and substance – and both much larger than anything else in the area. However, while Sacramento City grew rapidly and matured into a major metropolis, Boston was soon abandoned. During the 1860s, its land was divided by the northward rerouting of the American River. Afterwards, Boston’s southern portion was gradually absorbed into what became Sacramento’s industrial zone, while its northern reaches remained largely undeveloped until much of it became parkland a century later. Boston was apparently a “paper city” that existed primarily to fleece investors unfortunate enough to buy land amongst the shifting channels at the confluence of two major rivers. Its most visible footprint can be found on an 1850 navigational chart by Cadwalader Ringgold. It turns out that Ringgold was also Boston’s surveyor, so he had a conflict of interest in depicting the place as a competitor to Sacramento City. Ringgold went on to great success in Sacramento speculation, buying and selling large tracts of land. On the other hand, little or nothing seems to have been built along Boston’s streets. Boston was perhaps a better site than the one that grew in the swamplands between Johann Sutter’s embarcadero and fort (despite his objections and his lack of legitimate title). Boston certainly could not have been any worse a site than Sacramento City, which sprawled across the wetlands south of the American River. Boston’s location actually provided a better connection between the navigable Sacramento River and overland routes from the East and to the mines. But Boston was not just a better location in the abstract – a close inspection of modern property lines reveals that the lost history of Boston echoes to the present day. Its absence explains gaps in Sacramento’s eventual development, and is in turn explained by the false revisionist history that we accept as true. The failure of Boston helps to explain the large urban wilderness that is now Discovery Park, located on high ground that once included the central Nisenan village of Pujune. We would expect this area to have developed in ways similar to what is found downtown or in West Sacramento. During the Gold Rush, the Sacramento area was the heart of a volatile economic and social system – and a relatively stable landing spot for one of the most dramatic movements of human beings in world history. We can understand that movement better if we look beyond the successful settlements and examine the schemes that didn’t quite make it. The confluence was home to one of very few persistent settlements of fortune-seekers. Here, one could get rich selling just about anything to those who chased after the latest strike, and who could build or abandon a town of thousands in days. Given the ongoing value of land around the confluence, it does not make sense that there would be no settlement north of the “American Fork” that flowed in from the Sierra Nevada. At Boston, those arriving from the East or headed back to the northern mines would have avoided the final additional crossing of the American River, which faced those passing through Sacramento City. Later, the Boston site would have been a better terminus for the transcontinental railroad, and then for additional railways that reached the San Francisco Bay. Indeed some remnants of Boston connect to the railyards that were eventually built in the decades after the land scheme’s collapse. And as land routes developed, crossings of the Sacramento River would have been easier upstream of the added flow from its volatile tributary. Boston was an obvious place for a city, and yet nothing seems to have developed there. with large public squares, and reservations for school-houses, churches, and public buildings. One of the peculiar advantages of Boston is that, being located on the northern bank of the American Fork, it is not necessary in proceeding to the gold mines to cross that river, which is exceedingly high and rapid at some seasons of the year…Lots are selling rapidly at from $200 to $1000 each and before many months, the city of Boston on the golden banks of the Rio Sacramento will rival its New England namesake in business and importance. His prediction proved wildly optimistic – perhaps because the lots closest to the confluence were on low and flood-prone land. However, Buffum offered a key clue that allows reconstruction of Boston’s footprint: He described its grid as being made up of blocks measuring 240 by 320 feet, which matches the rectangular pattern in Ringgold’s chart inset – of “the cities of Sacramento and Boston” – depicting a large city encompassing more than 100 city blocks stretching more than a mile up both rivers. This screenshot links to the Confluence interactive map, showing many of Boston’s old streets and how they fit into the modern world. A new roadway at the edge of the Railyards redevelopment seems to be an unintentional reconstruction of what was once Boston’s southernmost intersections. The old PG&E power plant lies on a set of parcels that closely matches Boston’s grid, taking up most of two old city blocks. The former Rusty Duck parking lot may have once been a waterfront street facing the long-lost curve in the American River. None of this is conclusive evidence that Boston ever got beyond its initial land sales by Ringgold and his partners. I’ve so far found no evidence that Sacramento City’s lost sibling ever existed as a functional community. Yet there are hints that this was not merely the fault of Boston’s residents – perhaps Sacramento City’s promoters actively killed off this competing town, leaving only scattered legal traces. Although the Boston survey left numerous marks on the legal landscape north of the American River, this failed scheme strangely never seems to have been a topic of conversation among its southern neighbors; Boston was rarely – if ever – mentioned in Sacramento City newspapers of the early 1850s. Whether Boston was merely a paper town that existed to cheat settlers and speculators, or whether it struggled for a while before collapsing, there seems to have been a general understanding that Boston was not part of Sacramento’s history. There may yet be undiscovered references to Boston. Over the years, a huge number of real estate transactions, lawsuits and other exchanges have no doubt taken place on land that was once Boston; any one of these stories might have prompted someone to do a little historical research. Unfortunately, such references are so many needles in a haystack. “Boston” is a particularly challenging term for digital searches, as the vast majority of returns are in reference to the city in Massachusetts. Perhaps Boston just wasn’t very interesting, but that seems unlikely. 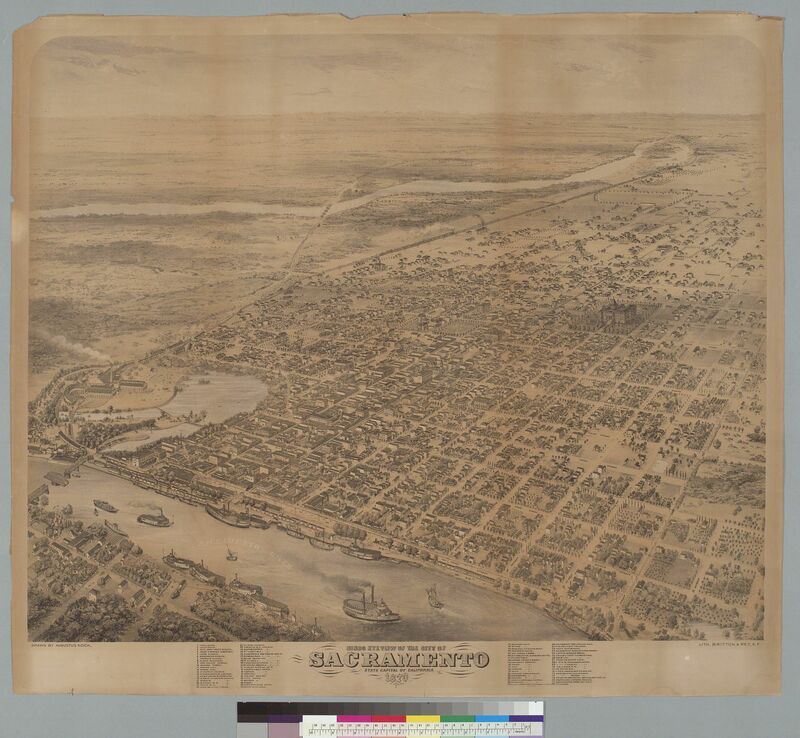 Its site appears in the 1854 map of Sacramento City as a rough area of waterways, trees and rocks. A similar depiction appeared in the 1873 Gray’s Atlas map. These maps both seem designed to convince people that there was no such town, which would have been unnecessary if there actually had been no such town. Whatever the details of its demise, it is now clear that Boston was more than just marks on a map. Although much remains unclear, Boston now joins the gallery of gaps in Sacramento’s history. It is yet another missing link in the broken chain connecting us to our origins as a city of struggle between settlers and speculators. There must have been people wanting to settle on the land occupied by Boston, but something prevented the founding of a sustainable community. The Boston land offering may have been a scam selling junk land, doomed to failure. But it is simply not plausible that nobody ever wanted to live on the northern bank of the lower American River. It is certainly possible that Boston failed due to simple mismanagement. Perhaps its landowners were simply unable to come up with a coherent system of governance that was needed to address the urgent threat of flooding. Perhaps the infant town was simply wiped out by the flood of 1850, which also inundated even the highest parts of Sacramento City. In any case, we might expect the success or failure of a neighboring town to be of interest to early Sacramentans, who faced similar challenges. At the very least, there should have been warnings to avoid buying land in Boston, and reports of its hapless victims’ suffering. Yet the (surviving copies of) newspapers were apparently silent on the fate of Sacramento City’s northern twin. The absence of any early settlement at Boston’s excellent location suggests that development was impeded by something. The relative absence of stories about Boston’s failure suggests that development was impeded by someone. Who would do such a thing? And why? Things are not as they seem in the River City, and Boston is only one of several lost communities. Nowadays, the Sacramento area’s original Indigenous and European settlement sites – including a pair of modest street systems at key crossings of the American River – are largely abandoned wastelands. Meanwhile, Sutter’s preferred urban site downstream of Sacramento City is today an indistinct expanse of suburban development, with only faint traces of that failed city’s old grid. The quiet burial of Boston seems to be part of a larger project of historical suppression, which was concocted over decades to enrich and then redeem the crooked speculators who built the city across the American River. This same project has provided Sacramento with a scrambled narrative full of deeply flawed maps, villains made into heroes and heroes made into fools. Setting the record straight is a key part of the mission of Confluence Tours, and the recovery of Boston’s history will be an ongoing part of the effort. This interactive map shows tour stops and additional context for a tour presented by Confluence’s Andrew McLeod and Sacramento County Historical Society board member Eric Bradner, February 19 and May 6, 2017. The tour and map explore the original southern boundary of Sacramento City. This seam between real estate schemes envisioned city lots to the north and farm parcels to the south. But while the Grid became a familiar term for our city’s heart, the “Ten Acre Tracts” have faded into obscurity. This low swampland faded into a neglected industrial zone between the river and cemetery, home to residents of the Alder Grove public housing project but increasingly empty in recent decades. Now, the area is seeing some of the same dynamics of gentrification found elsewhere, most notably the recent demolition of the old Setzer lumber complex and the rise of the Mill housing development. But, like most attempts to redevelop our city, it has moved in fits and starts, yielding an area that is still a work in progress. During 1851, the leading merchants of San Francisco unleashed a reign of terror known as the Committee of Vigilance. This cabal hanged four individuals, whipped one and deported 14 – according to their own records (pp 826-7). These Vigilantes mostly targeted Australian immigrants, who were stereotyped as criminals at the time. This was a political operation that exploited prejudice through exaggerated threats; these lynchings took place over a six-month period before the September elections. The organization laid the groundwork for a second Committee of Vigilance, which reconvened in 1856 to pursue alleged “ballot stuffers” and other political targets. The Vigilance organization apparently infected San Francisco’s power structure, with long-term results. This should serve as a warning in our own era of rising vigilante sentiment. There are parallels between 1851 and the escalating rhetoric questioning the soundness of the 2016 presidential election – which has often deployed anti-immigrant sentiments. So further study is urgently needed to better understand the precedent for orchestrated mob rule in our society, and how an important part of that history has been suppressed. The movement’s impact – and its origins – extend far beyond San Francisco, and Sacramento apparently played a central role. To understand where our society might be going, we must know where we’ve already been. It is time to reckon with Sacramento’s role in the Vigilance of 1851. The San Francisco Committees of Vigilance have been the subject of numerous books and papers. The record of their dark deeds – although obscured by time – is still mostly intact. However, the role that Vigilance played in Sacramento was well hidden. This city’s own lynchings only rarely appear in histories, and those accounts overlook these mobs’ connections to each other, and to the mobs of San Francisco. The omission is unfortunate, as a holistic examination of the Committees of Vigilance points toward a challenging new understanding of California history: The abuse of immigrant scapegoats paved the way for an illegal seizure of power that was never reversed. We have not learned the lessons of a successful coup d’etat whose power spread far beyond San Francisco and lasted well beyond the 1850s. The lynchings of 1851 are among Sacramento’s least-understood historic episodes. These were not the city’s only lynch mobs, but this series’ connections to each other and to events in San Francisco cast a sharp light on dark political forces. The Confluence research you are about to read has only begun to unearth the truth about Sacramento’s turmoil, but the nearly simultaneous timing between San Francisco and Sacramento lynch mobs strongly suggest a coordinated inter-city effort to deploy mob violence as a tool of political control. Lynch mobs of the lawless West are generally seen as spontaneous responses to especially offensive crimes committed in the absence of the law. We tend to imagine dozens or perhaps a hundred people gathered in some dusty one-street hamlet. However, the large crowds of 1851 – often reported to number in the thousands – actually gathered in established cities. What’s more, these mobs were apparently incited by an organized regional elite that was losing control. The notorious speculator Samuel Brannan – who might remind us of a certain modern-day political figure – played a major role. Most notably, Brannan hosted the meetings that launched the San Francisco Committee. Given Brannan’s central role in the creation of Sacramento’s land scheme and government, as well as his ongoing speculation in Sacramento, the pattern of synchronized lynch mobs is unlikely to be a coincidence. California’s two main cities, in many ways, functioned as a single economic and political system, funneling goods and people from the ocean to the gold fields, extracting wealth for the benefit of an interlocking elite. Brannan was at or near the center of this system. Although this introductory research cannot yet yield conclusive statements about how and why lynch mobs really erupted in the tumultuous year of 1851, we must consider an unpleasant explanation: Faced with numerous challenges to their rule and unable to defeat their adversaries directly, Brannan and his fellow speculators clung to power by whipping up anti-immigrant hysteria. And even though the elite’s mobs killed only a few marginal individuals, the show of force helped to hold off the many challenges to their power. While the San Francisco Committee is better known, Sacramento had its own Committee. In fact, the Vigilantes’ first kill occurred in Sacramento, where the threat to the establishment had originated. The Sacramento lynchings began with the hanging of a murderer named Frederick Roe in February and ended with the execution in August of a trio of thieves known as Thompson, Gibson and Robinson. The latter incident occurred just before the election, and was coupled with the governor’s lynching in effigy. In 1851 the Speculators who had bought into Brannan’s crooked Sacramento land scheme were on the defensive. Six months before the deployment of lynch law, Sacramento had been rocked by the “Squatters’ Riot” – better seen as the climax of a revolutionary uprising. Eight people died of gunshots on August 14-15, 1850, including the sheriff and assessor. Mayor Hardin Bigelow was gravely wounded and departed town to die of cholera in San Francisco some months later. In the wake of the uprising, numerous banking and real estate ventures failed. The newspapers in both cities were full of auction notices and “assignments” of property – analogous to modern bankruptcy. Meanwhile, Brannan’s adversaries were doing rather well. The squatter agenda was ascendant as the Speculators’ real estate bubble collapsed. Locally, another Settler leader named James McClatchy ran (unsuccessfully) for Sacramento mayor as he co-edited the Settlers’ and Miners’ Tribune. County attorney John McKune moved his office into the Tribune Building at 4th and J streets, a sort of Settler headquarters that overlooked the site of the uprising’s opening shots. By the start of 1851, the Speculators must have sensed that legal methods would not ultimately resolve Sacramento’s land issues in their favor. Even worse, “squatter trouble” was spreading and intensifying, now threatening even legitimate titles. A key development came on February 3, 1851, when the Daily Alta reported a violent confrontation in San Francisco; Capt. Joseph Folsom had to fire upon squatters building on his waterfront property. Within weeks, severe unrest erupted in San Francisco. Mobs attempted to lynch James Stuart and J. Wildred – two Australians accused of theft and believed to be notorious bandits. Large mobs repeatedly threatened the jail and courthouse, although it is unclear whether their actions were being orchestrated at this point, as no formal organization existed. After a week of thwarted attempts to hang Stuart and Wildred, the action abruptly shifted to Sacramento. There, on February 25, Frederick Roe – a 20-year-old from England – was involved in a gambling dispute that escalated into a brutal beating. When a bystander tried to intervene, Roe shot him, in broad daylight on a crowded street. Roe’s immigrant identity seems to have played only a minor role in accounts of the day. His crime certainly fits our modern stereotype of what might inspire a frontier lynch mob to form. However, it is possible that his English accent raised suspicion that he was a “Sydney duck” – the most hated and feared of Gold Rush immigrants, due to the presence of British penal colonies there. In any case, Roe seems to have walked into a trap that had been set – news coverage suggests that someone was waiting for just the right rascal to string up. The very morning of Roe’s lynching at 6th & K, the Transcript had enthusiastically reported “Great Excitement at San Francisco” with “The citizens, at last rising determined upon Lynch Law” for Stuart’s and Wildred’s the lesser crimes of theft and battery. What happened to Roe was going to happen to someone, sooner or later. After the death of Roe, things settled down for a couple of months. Then, amidst local elections in early May, a fire destroyed a large portion of San Francisco. This disaster was blamed on Australian “incendiaries” who supposedly set the fire as a cover for looting the city, despite initial reports of the blaze’s accidental origin in a highly flammable paint shop. This call for blood, signed with the name “Justice,” seems to have been well received. By June 10 the Committee of Vigilance had established its constitution in meetings at Brannan’s warehouse. The group boasted a starting membership of 103 of the city’s leading men. And within hours of the Committee’s official birth, John Jenkins, an Australian with awful timing, was caught making off with a safe and beaten upon arrest. He was hanged that same night in a chaotic scene that very nearly erupted into warfare. Meanwhile in Sacramento, the Daily Union of May 9 reported a “Committee of Eleven” had formed at a large meeting just after the San Francisco fire, dividing the city into districts for volunteer patrols. The next day’s paper included a report of a “city guard” patrolling every block, as well as an exaggerated account of “Stockton in Ashes” to further agitate the community. Unfortunately, whatever little news was reported is now mostly missing. Aside from the Union, there are few surviving specimens of Sacramento newspapers printed during the rise of the Vigilantes. Although complete collections exist for the first year of both of Sacramento’s most prominent early papers, each abruptly disappear as events in the city became more dramatic: The continuous collections of the Sacramento Transcript end during the first week in June, just days before the “Propositions” were presented to San Francisco; the pro-miner Placer Times had already disappeared a year earlier, during the escalation toward the Squatters’ Riot. It is suspicious that so little news survives from such a newsworthy time, especially since one might expect more recent issues to have a better chance of survival. The missing editions do not indicate breaks in publication. Nor do they reflect the ephemeral nature of many Gold Rush publications; both papers continued publishing until their merger on June 16, moved to San Francisco a year later, and merged with the Alta in 1855, continuing until 1891. These lost issues may survive somewhere, but they are not in the usual places in which newspapers are found by researchers. Their absence may partly account for why Sacramento’s Vigilance has escaped historic notice. Future Confluence research will explore the state of the Vigilance-era journalistic record, and examine whether the sudden end of complete collections indicates an intentional destruction of contemporary reports, perhaps connected to other anomalies in Sacramento’s historic record. The stereotypical Wild West lynch mob operated in lawless where courts had not yet been established zones – new settlements and mining camps, for instance. But these mobs were something else. The connections between Sacramento and San Francisco, suggested by the synchronized mobs of February and June of 1851, became harder to ignore as the summer wore on and the Vigilance organization improved. Mob rule continued to erupt almost simultaneously in both cities, indicating coordinated agitation rather than organic community responses to particularly outrageous local crimes. Crimes and lynchings were sometimes separated by months. After the San Francisco Committee’s formation in June, much of the summer passed in relative calm. But when “excitement” did occur, it tended to occur in both cities – usually within a day or two. For example, in San Francisco James Stuart was finally hanged for his February crime on July 11 – two days after a gang of robbers in Sacramento faced a lynch mob that sentenced each of the accused to as many as 75 lashes, but then (temporarily) handed them back to legal authorities. While damage was indeed done to the rule of law by events in the late 1840s (including the Bear Flag Revolt and the United States’ failure to accept California as a state during the Gold Rush population boom), there were nevertheless functioning legal systems in both cities. San Francisco had relatively stable courts for generations before the rise of the Vigilantes, under both Spain and Mexico; these courts carried over after statehood, with some adaptation. Sacramento had some form of courts and professional law enforcement for over a decade, and had operated a prison ship for more than a year. In any case, both cities were capable of numerous evictions of settlers who claimed land by preemption rather than through purchase from the speculators. So any selective failure of enforcement seems more a matter of will than ability. As events in Sacramento would show, the Vigilantes sought to undermine outgoing Democratic governor John McDougall. He was an Irish Catholic, subject to some of the same suspicions aimed at many of the lynching victims (indeed, his religion and ethnicity would be specifically targeted by the 1856 Committee). The year’s final wave of lynch law peaked shortly before the gubernatorial election of September 3, 1851. This outbreak would include a shocking symbolic message. On August 21, the San Francisco Committee attempted to lynch Australians Samuel Whittaker and Robert McKenzie. The police held off the initial attempt, and the action moved back to Sacramento. The trio of thieves arrested in July – Robinson, Gibson and Thompson, all British immigrants – were due to hang despite Robinson’s reprieve from governor McDougall. Although the three were convicted in a court of law, their execution must still be considered a lynching because a mob overrode the actions of government. Sheriff Ben McCullough later read the governor’s reprieve as the crowd cried out for a hanging and surged threateningly. He then handed Gibson and Thompson over for transport to the scaffold erected at 4th and O. He also ordered his guards to return Robinson to a prison ship on the river, but the mob intervened. Then, “the sheriff having performed his duties efficiently and faithfully, retired from the scene, as did also the officers with whom he was connected.” That is, the last veneer of legal order gave way under pressure from the mob. Robinson was hanged, against state law, while the local government looked the other way. But this was not the day’s final insult to the rule of law. That evening, the governor was hanged and burned in effigy outside the Orleans Hotel – the usual meeting place for Sacramento Vigilantes. This was a potent message to McDougall as well as his successor. Later that weekend the Committee once again attacked the San Francisco jail. This time they succeeded in their “rescue” attempt, extracting Whittaker and McKenzie during church services and lynching them that afternoon. The San Francisco Committee of Vigilance is generally thought to have disbanded after lynching Whittaker and McKenzie. However, the visible organization of 1851 is better understood as the foundation for later power grabs. It lay quietly beneath the power structure. A study of later Vigilance is beyond the scope of the present writing, but a brief examination will help understand the impact of the first Commitee. The Vigilantes reconvened in 1856 with increased strength and greater political focus, essentially rendering the city and state governments powerless to enforce the law. From their fortified headquarters “Fort Gunnybags,” they would demand the surrender of prisoners at cannon-point. Another four men were lynched, including James Casey, the killer of a pro-Vigilance newspaper editor, James King of William. Sure enough, shortly after Sherman’s writing, the Vigilantes returned in July of 1877, when the so-called Committee of Safety violently suppressed anti-Chinese race riots, using a militia known as the Pickhandle Brigade. This Committee was under the leadership of none other than William Coleman. It appears that the old Committees’ executive body had assumed a lower profile and continued to exert control behind the scenes for more than two decades. It re-emerged when its interests – such as a cheap workforce of Chinese immigrants – were threatened. Sacramento’s Vigilance aftermath is even murkier, and much more research is needed to sort out how this city’s Committee truly ended, or whether it also blended into the power structure with ongoing effects. Confluence research into later events suggests the latter. The legal turmoil connected to Sacramento’s original land title issues continued for at least two decades, with some degree of corruption evident in the legal system up to the U.S. Supreme Court. Sacramento remained turbulent for at least two decades – until the 1868 Ejectment Suits resulted in a legal free-for-all instigated by a rogue’s gallery that included at least one prominent judge. It is difficult to believe that such important events were lost to history. However, that seems to be the case – as elaborated by a report of “anomalies” uncovered for the Sacramento County Historic Society. The Vigilance of 1851 is a key piece of this puzzle, as it provides clues for how Sacramento could be pushed to accept a historic revision that was – at least in some cases – obviously false. The apparent use of mob rule provides one plausible explanation, and its role will be the subject of future Confluence research.